Finished these - the last of the 1st Corps figures I had sitting around for a while. Actually still have a Spartan lochagos and bolt thrower to complete. 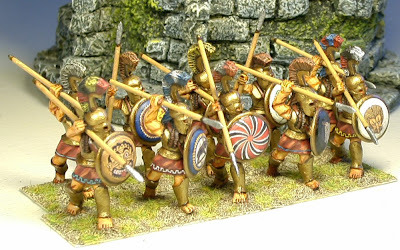 These Argives and Spartans will fill out the front ranks of two hoplite units; Old Glory hoplites filling in the rear ranks. I'm off to the Panzer Depot for their Black Friday Sale! Taking a break from the Roman Seas build (still need to get some Baccus 6mm figures), I knocked out some 1st Corps Spartan hoplites. 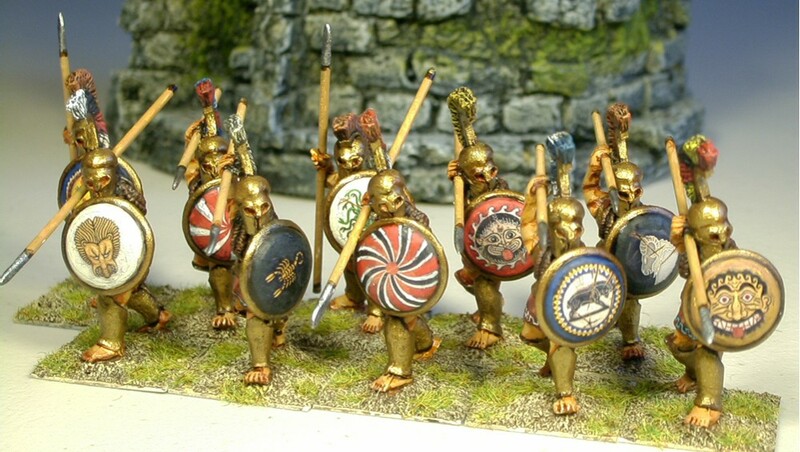 These were fairly easy to paint, as they have bell-cuirasses and no pteruges (the stuff that hang below the cuirass). 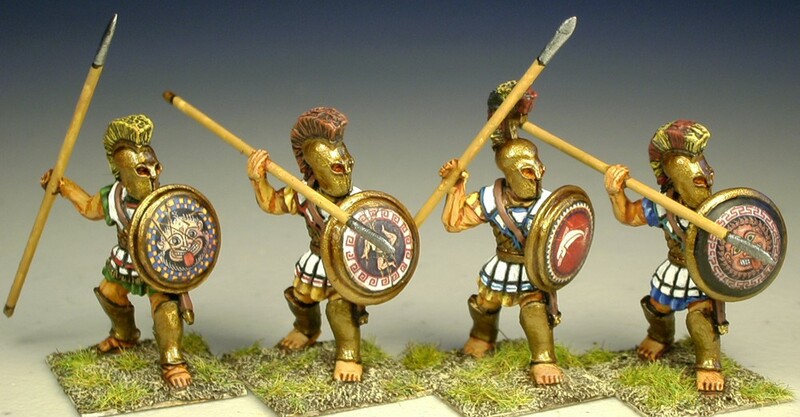 The Argive/Athenian hopliltes take a little more effort with their composite linen & scale cuirasses. I used a technique mentioned by Jeff Jonas in the Alexander the Great WAB supplement on how to make those geometric patterns on the bottom of their tunics. It's actually not too hard - and painted for effect more than perfection. These are wargame standard paint jobs - no eyes or other minutiae. Oh, and the shields are LBM transfers from their 1/72nd scale range. 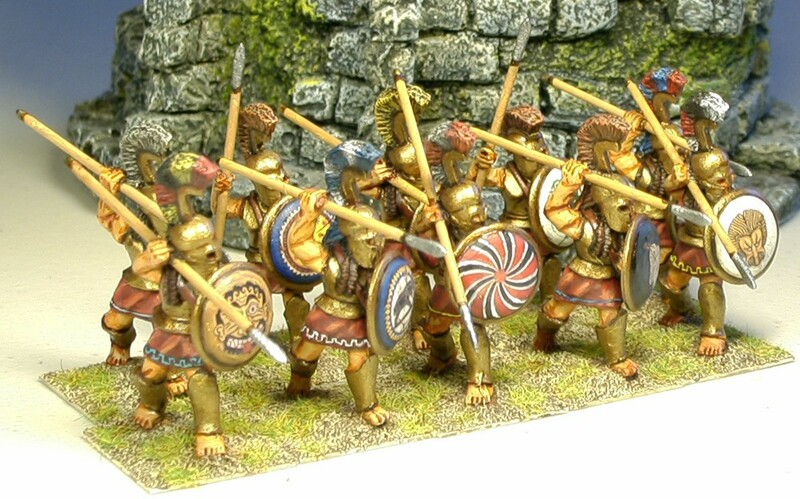 Although these guys are in armor more common a generation or two (or more) before Alexander and his Successors, I still plan to use them as Greek mercenaries for a Macedonian or Successor army. They could also be Italians or Etruscans too. I started on these late yesterday afternoon and managed to finish them before bedtime. 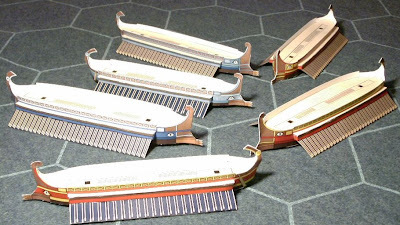 These are the large ships in the Roman Navy set - Quadreme, Quinquereme, and Hexeres - two each. They are noticeably larger than the earlier small vessels. The largest, the Hexeres, is approximately 8.5" from stern to ram. Since they are fairly large, including the decks, I wanted to make sure they would be able to support 6mm lead figures and artillery, so I modified the build a bit. All the ships were initially printed on 60lb. card, which my local Staples had - before jumping to 100lb. The smaller ships are fine with 60lb. However, what I did for the larger ships was this: Using spray-on tack, I added normal printer paper (20lb.) to the backs of the ships' hulls (total 80lb.). 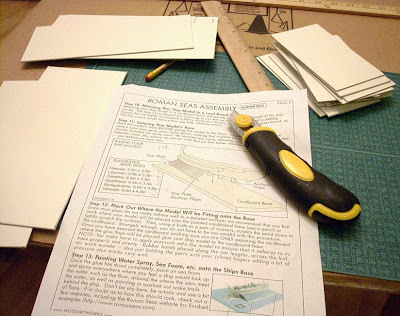 Two sheets of paper were added to the bottom of the decks (total 100lb.). I did not add more paper to the oars and outriggers, though. These I felt didn't need to be any thicker than 60lb, because of the folding they required. Also, these would not support any extra weight, unlike the decks holding figures. I also drilled/punched holes for masts. I wanted the option to use sails for these large ships. I don't intend to use sails for the smaller vessels since the deck would be too cramped already with figures. 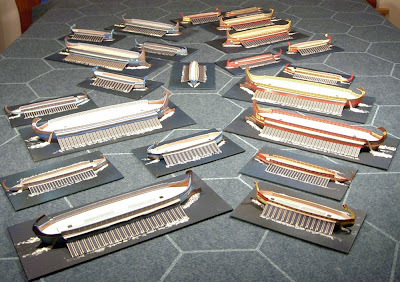 Here are all of the ships in the Roman Navy set - 22 ships total - quite cramped for the 6' X 4' mat I have. Probably okay for combat, but not so great for maneuvering prior to. Next I will finish the movement bases and then mount the ships on them. I went to Michael's today and used a 40% off coupon to buy a 20' X 30" sheet of illustration board. The label states it is "Medium Textured Surface" and "Medium Weight (0.50-.060). I didn't do any math beforehand, but I was able to cut out bases for all 22 ships in the Roman Navy set - with leftover board. 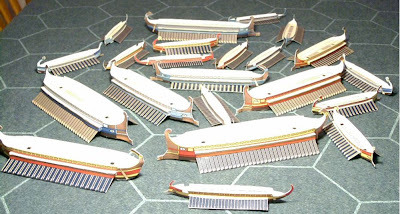 The bases are as follows: 14 - 5" X 3" bases for 8 Hemoilas and 6 Liburnians; 2 - 8" X 3.5" bases for 2 Triremes; 2 - 8.5" X 3.5" bases for 2 Quadremes; 2 - 9" X 3.5" bases for 2 Quinqueremes; and 2 - 9" X 4" bases for 2 Hexeres. I also picked up a can of spray adhesive to apply backing to the larger ships. 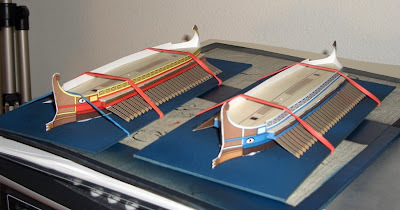 I might even use manila folder card stock for the decks of the larger ships. Not sure what I will do to finish the bases. I have some pressed blue paper with nice texture. It is actually my wife's stash of colored paper she has when she had a box-making hobby. 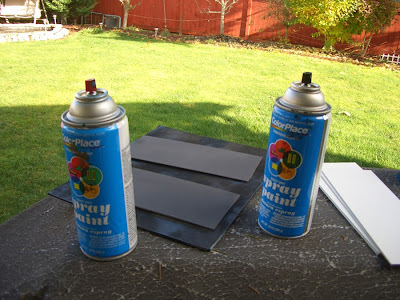 Or, I may use some type of blue spray paint - maybe some type of textured spray; although it is likely to be expensive. As you can see in the photo, I just used rulers to measure the bases and cut them out with a carpet knife. Didn't take long at all. 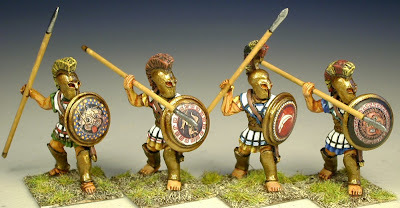 In addition to this, I also wrote a short article on Bronze Age Greek wars for the next Citadel. All the medium and small ships are done. These would be the Triremes, Liburnians, and Hemoilas (hope those are the plural forms). The smallest ones, Hemoila, have some thin areas, so you should be careful when cutting. These, and the Liburnians, were a bit easier to build since they didn't have the outrigger part to glue on. 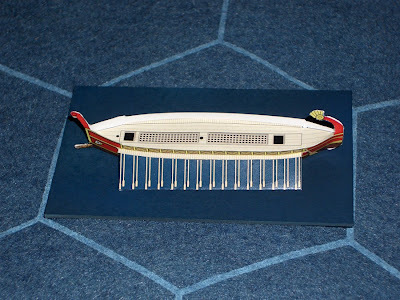 The oars go directly onto the underside of the protruding part of the deck. Again, none of these have the optional inner panels - which I may or may not add. I plan to have troop stands of 6mm figures and artillery, so maybe I won't need to worry about the bare look of the inner panels. Next up will be the large ships; two each of the following: Quadreme, Quinuereme, and Hexeres. I plan to strengthen the deck with additional paper or card (maybe from a manila folder).